Winter is coming and as night gathers, the Order of the Night’s Watch seeks a new Lord Commander from among their ranks. With depleted resources and weakened forces, the current Lord Commander, Jeor Mormont, wishes to promote a brother who can both improve the failing infrastructure of the area south of the Wall known as the Gift, and protect Westeros against the bands of wildlings that gather in the Frostfangs. Will that brother be you? 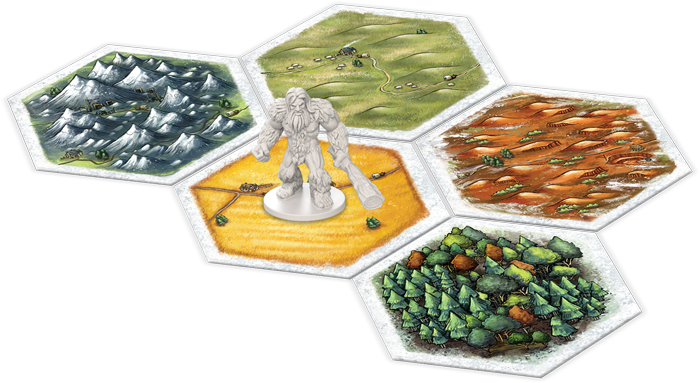 A Game of Thrones Catan: Brotherhood of the Watch is on sale now! 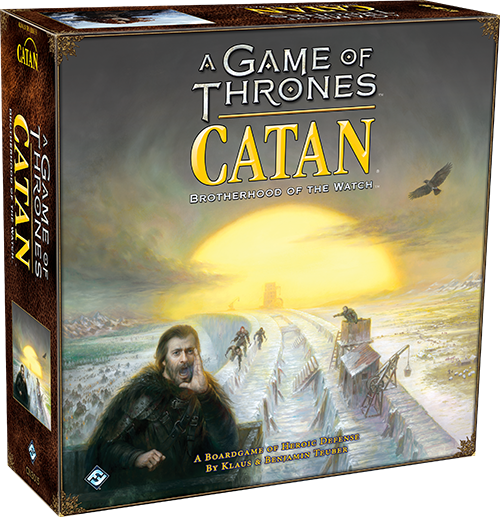 A Game of Thrones Catan: Brotherhood of the Watch transports three to four players to the realm of Westeros where the Brotherhood of the Night’s Watch is in peril. Resources are depleting, wildlings are pressing in from the North, and the Order is divided by infighting. The Old Bear, Jeor Mormont, seeks a successor who can bring order to the chaos. In these tumultuous times, you are thrown into competition against your brothers to prove that you are the most skilled and most worthy of promotion. To earn the recognition you deserve, you and each of your rivals have been assigned a section of the Wall to maintain, and given control of two roads and settlements that will allow you to harvest resources from the Gift. From these humble provisions, you must expand your reach to prove that you are the sole member of the Order who can return the Night’s Watch to its former glory. 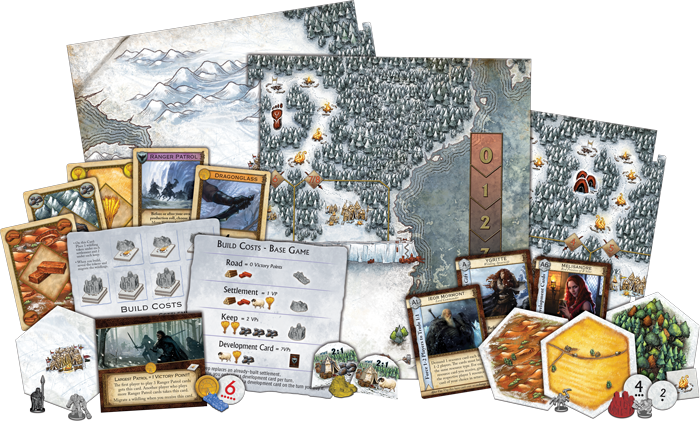 At the beginning of each turn, the active player will roll two six-sided dice to determine which resources can be harvested, and one twelve-sided die to see which wildling clans, if any, advance toward the Wall. Once you have gathered the resources you need, you can strengthen your hold on the north by building roads, settlements, and keeps; recruiting guards to man your section of the Wall; or purchasing Development Cards. Each of these actions can earn you prestige within the Watch in the form of victory points. The first player to reach ten victory points earns the title of Lord Commander. This task is not as simple as it may first appear. The north is more treacherous than any land you have seen in other iterations of Catan. As such, you will gain the assistance of one of the north’s greatest heroes to aid your pursuit of power. 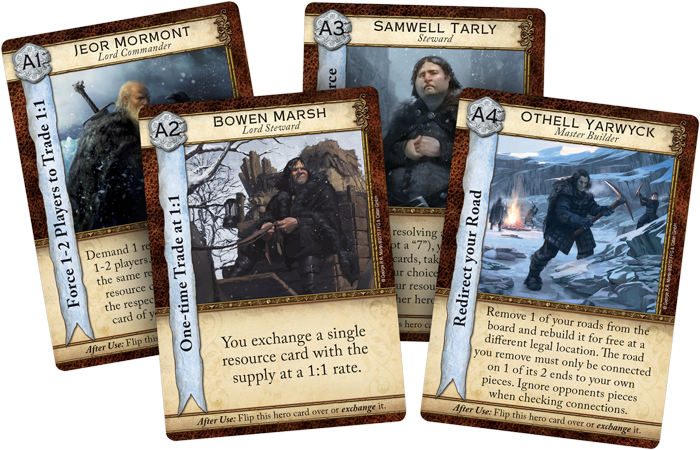 At the beginning of the game, each player gains a hero of the Night’s Watch with a special ability that they may integrate into their strategy. These heroes include iconic characters such as Samwell Tarly, Bowen Marsh, Othell Yarwick, and the current Lord Commander, Jeor Mormont. By calling upon the influence and skills of these brothers, you may ease the difficulty of developing the Gift or force rivals to offer more favorable trades. However, the brothers cannot be seen to favor one competitor too strongly, and you'll switch which characters you're using several times throughout the game. Heroes and their cards cannot be traded, given away, or stolen, but your loyalties may shift during play. If you choose to extend your loyalties beyond the bounds of the Order, you can call upon the red priestess Melisandre, or even the wildling Ygritte. Aligning yourself with outsiders may cause other members of your Order to question your loyalty, but with the most powerful position within the Order on the line, the risk may well be worth the reward. The most important mission of the Night’s Watch is to defend the Seven Kingdoms from the threats that lurk north of the Wall. While you and your brothers are struggling in competition within the Gift, three wildling clans are gathering their forces and marching south to invade the Gift and claim its rich resources for themselves. Each clan consists of three types of wildling: regular wildlings, climbers, and giants. Each of these types presents a unique challenge to the men guarding the Wall. When they reach a clearing just north of the Wall, regular wildlings lay in wait until they outnumber the guards—at which point they breach the wall. Meanwhile, climbers can slip past guards and invade the Gift without resistance, and giants remove a guard before returning to the Frostfangs. If wildlings break through your defenses and raid the Gift, they act as robbers, blocking resources and wreaking havoc. However, if you sense that you are falling out of favor within the Watch, but you prefer a militaristic strategy, this may act in your favor. 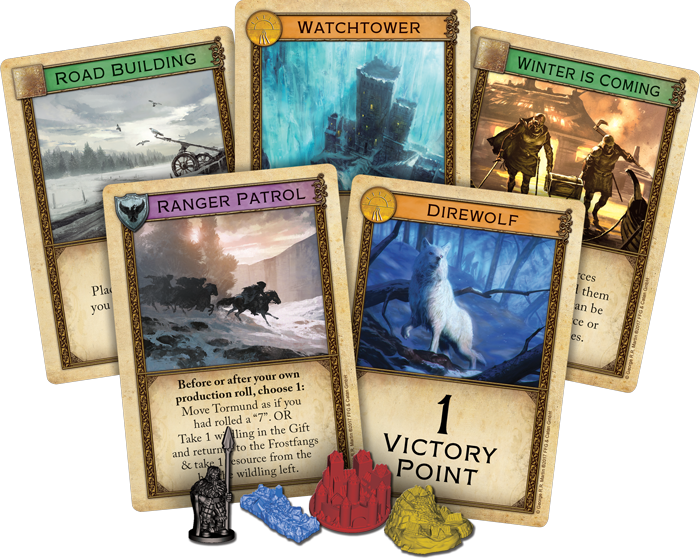 A Game of Thrones Catan: Brotherhood of the Watch offers players two paths to victory, embodying the moral grey that pervades Westeros. Firstly, you can achieve victory through traditional methods, improving infrastructure within the Gift, recruiting guards, and using Development Cards to increase your prestige until you have achieved ten victory points. However, if your defense of the Wall fails and wildlings overrun the Gift, the brothers of the Night’s Watch can no longer delay their decision and the player best equipped to handle the wildling infestation receives the title. If the Wall has been breached three times or eight or more wildlings occupy the Gift at any time, the game ends immediately and the Night’s Watch elects a new Lord Commander—the brother who has the most loyal guards at their command. Whether you are willing to temporarily sacrifice the safety of the Gift in pursuit of your own ambitions is entirely up to you, however. Pledge your life and honor to the Night’s Watch. Take the black, defend the realms of man, and become the Lord Commander! Pick up A Game of Thrones Catan: Brotherhood of the Watch (CN3015) at your local retailer today! A Game of Thrones Catan: Brotherhood of the Watch challengs players to draw upon resources to build, defend, and ultimately become the new Lord Commander of the Night's Watch! Improve the infrastructure of the Gift, defend the wall from the wildling horde, and rise above your brothers and gain the recognition you deserve.